1) I have previous injuries and physical limitations can I still do this? 2) I’m overweight and extremely out of shape I don’t know if I keep up in this program, is this for me? 3) I’m in my 60’s is this program for me? 5) I have a very busy schedule what hours are available? 6) Will I be working out with people my age or all ages? 7) Is this a Boot Camp? 8) How regimented is the eating plan I’m (vegetarian, lactose intolerant, can’t Cook etc)? 9) I have NEVER worked out can I do this? 10) How long are the sessions? Up until 45 or so you can pretty much get away with saying exercise is “optional”. After 50 exercise is “Essential” to your health, independence, quality of life and longevity. P.s. It’s never to late to be your best ever. Summer is over, kids are back in school, vacations are done, it’s time to get back on track and into our routines. The good thing about routines is it can give you structure and a sense of control. The downside is routines can seem boring, especially when it comes to eating healthy. Kerri P shows a quick, easy, and healthy breakfast recipe she uses for when she and her family get tired of the same old breakfast meals. It’s beyond hot outside and will be for the next few months. So I want you to have some Simple Anywhere-Anytime Workouts you CAN do indoors and with minimal equipment. This is the 2nd of 4 Bodyweight Cardio workouts I’ll be sharing with you. This is a CHALLENGING workout. If you’re a beginner modify as needed and stop or slow your pace as needed the first time you do this workout. When you do this workout a second and third time you’ll be able to go harder/safely because you’re more familiar with it. • Do each exercise for 1 minute. P.s. Don’t wait until it’s too late to get your body back! Fort Worth Personal Trainer: Does WORKING OUT EVER get EASIER? Some of the most important questions about exercise, workouts, nutrition, mind-set and staying with working out over the long haul…never get asked because people think they’re the only one experiencing it. Because just like anything new like exercise,eating well, and establishing healthy habits. You don’r know what you don’t know. Not knowing the answers to some of these questions can be fatal to your results, because one bad day or week can discourage you to the point if not quitting, questioning your commitment. In this video today I’ll cover a question that’s come up over the years and I’d like to hear your feed back too. Does EXERCISE EVER Get Easier? And I give you 2 KEY tips to increase your resiliency to the grind of exercise. And there’s a BONUS answer to how often and what to do on those REALLY bad days. Brining you another Healthy Food Haul today. Along with the Worlds EASIEST Chicken Recipe. As you know nutrition is 85% of your results when it comes to weight loss and fitness. 15% comes from your exercise. And since no two people eat alike you need a lot of examples of what works for people to pull from. You can’t be afraid to TEST (or TRY) things either. Run out the door every morning without breakfast because you don’t know what to make. Have a go to of a meal replacement or 2 hard boiled eggs. Can’t pack fruit for your mid morning snack? Put a box of nutrition bars in your desk. Kerri also includes her go to quick and easy chicken recipe she uses for her and her family. Like she say’s “Nearly everyone eats chicken”. Healthy, high in protein, quick and easy, and family friendly. Christina Parr, 49, is a busy working Mom of a 9 year old who recently returned to our Accelerator Personal Training program after a 3 year lay off. She shares how over the 3 year period after her daughter started school and her work and her work schedule caused her to drop out. She found herself gaining 14 pounds, not having any energy for the day, and most important she was waking up physically hurting and lethargic. NOT how she wanted to feel. And knowing she has a 9 year old at the age of 49, she said she knew she had to stay in shape to keep up as a Mom. After only 4 weeks she’s getting her body back, her energy is up and most important she feels better every day. Christina opens up about dealing with depression and how exercising consistently helps her mood and overall well being, that benefits everyone in her life. She shares her 3 best nutrition strategies. And her top 3 tips that helps this busy wife, mom, and professional stay consistent with her workouts even with a super tight schedule. If you’ve taken some time off and you’re not feeling or looking your best, we can help. P.s. If you’ve taken 3 months, 3 years, or even 30 years off we can help. Get the coaching, accountability, and plan to live your very best life. On Saturday I signed up new client Jennifer into our Accelerator Personal Training program. That evening she announced it on Facebook that she’d made a commitment to me and to the program. Because of this one simple action her chances of hitting her weight loss and fitness success multiplied 100 times. Research has shown that making a public commitment to making a change increases odds of success. Like I say “That’s why people stay on the Biggest Loser” you can’t back out when you’ve made a commitment on national TV. Peer pressure works at any age. 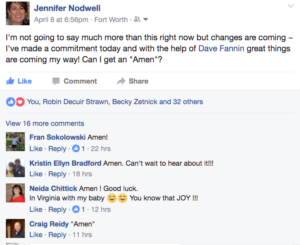 Making a public commitment like Jennifer is just one thing you can do to increase your odds of success. There was a fantastic article about making and keeping your New Years Resolutions in the NY Times by John Tierney a few years ago that’s as relevant today as when it was written. I’m going to give you some of the most relevant points from the article so you can put them straight into action. If you’ve joined a program, made a plan, or made a “resolution” for your weight loss and fitness goal here’s some good news. 1) You’re much more likely to make improvements than someone who has not made a formal commitment. 2)If you make it through the first 4 weeks you have a good chance of making it much longer. 3)You can boost your chances of success by employing as few strategies and tools to help you. Tierney reports- “They’ll fail because they’ll eventually run out of willpower, which social scientists no longer regard as simply a metaphor. They’ve recently reported that willpower is a real form of mental energy, powered by glucose in the bloodstream, which is used up as you exert self-control. The result is “ego depletion,” as this state of mental fatigue was named by Roy F. Baumeister, a social psychologist at Florida State University. He and many of his colleagues have concluded that the way to keep a New Year’s resolution is to anticipate the limits of your willpower. One of their newest studies, published last month in the Journal of Personality and Social Psychology, tracked people’s reactions to temptations throughout the day. The study, led by Wilhelm Hofmann of the University of Chicago, showed that the people with the best self-control, paradoxically, are the ones who use their willpower less often. Instead of fending off one urge after another, these people set up their lives to minimize temptations. The article continues with a story of how a Doug Tietelbaum a man very successful in business and utterly self-disciplined- yet could not stop himself from hitting a weight of 375 pounds. After Doug had a gastric sleeve inserted and he began exercising with a local trainer. When a sudden business venture forces Mr. Tietelbum to move to Las Vegas for a 4 month stay living out of his hotel. Instead of risking the lure of 24 hour room service and hoping he could just use will-power to exercise he put a plan together. The plan not only worked at keeping him from backsliding he lost 50lbs over the 4 month period. His plan had these components to help him succeed. 1) Pre-commit-Take action on your plan-for example- by cleaning out your kitchen and stocking up on healthy food. And also by telling or emailing your goals to your friends or posting it on facebook. 2) Outsource– outsource self-control by joining a website a boot camp or the ultimate accountability a fitness coach. 3) Keep Track-Weekly(the article recommends daily) weigh- ins are essential to moving forward and keeping your goals at the front of your mind. 4) Don’t Overreact to a Lapse- fall of the horse?- the rides not over- get back on. Don’t let slip ups(like an ice cream cone), that we all have, stop you in your tracks. Get up brush yourself off and keep moving toward your goal. 5) Tomorrow is another taste-latest diet research revealed if you’re presented with temptation(for example) a bowl of M&Ms and you tell yourself you can have them soon just not tonight. You have a much higher success rate than those who attempt to swear off eating M&M’s permanently. Just knowing that you can get them some time in the future helps with self-control in the present. 6) Reward Often-If you attempt to use willpower only to master your habits. It becomes a long grim thankless trudge. Reward yourself at milestones- drop 5lbs buy some new shoes, waistline shrinks time to splurge in new clothes. Don’t forget the advantage of having a weekly cheat meal too reward a week of consistency. There you have 6 of the best tactics for sticking with your weight loss and fitness goals this year. P.s. You’ll find everyone of these 6 tactics used in our Accelerator Personal Training Program. In less than 12 weeks you’ll radically drop fat and reshape your body with this simple nutrition coaching program. Don’t let the weekend change up throw you off your routine. Saturday mornings are traditionally a busy time in the gym. And their are all kinds of benefits to exercising on a weekend day. Number one of course you reenforce the “showing up” habit. Number two you’re not under the time constraints of running in getting your workout in and running out. Number three you will tend to eat better over the weekend when you exercise. Number four you reenforce your self-image as that “fitness person”. “Fitness person” doesn’t mean you walk around with a gallon jug of water all day, it means you make the effort to take care of yourself so you can be at your best for others. Even if you can’t make it to the gym, we have you covered. Here’s your weekend Anywhere-Anytime Workout. Click the video to play. My fitness boot camper Denice Thom will demo each exercise for you. P.s. Get the results you need to live the life you want at any age! Get the coaching, accountability, workouts, nutrition and consistency you need when you click right here. I meet with a LOT of people on a daily basis that want to make some changes to lose weight and get in shape. And one thing I hear consistently from women is they want to drop weight in the hips, buns, and thighs. I wanted to share with you today a quick Mini Leg Blaster circuit you can use at the end of your lower body workout. This Mini circuit is for you if you’re a advanced beginner to intermediate. If you’re not quite ready for swimsuit season and the idea of going to a big box gym and walking on a treadmill fills you with dread. 12 Weeks of Coaching, Nutrition, Fun Workouts, Personal support and attention and RESULTS you can see in the mirror and on the scale. We have 3 spots left open for my readers. Here’s your Christmas Eve “Service” workout. It’s simple and simply effective. When I start new clients and they have to travel for business or vacation shortly after we start this is the workout I send with them. 3 Simple movements that hit your entire body in a short amount of time. This workout is perfect for beginners and challenging for advanced. Beginners you can break it up as needed 10 of each 10 time or 4 sets of 25, you get the idea. Advanced add a 1 mile run to the beginning and end to make it “interesting”. Bodyweight exercises should be done straight through, meaning complete 100 squats before you move onto push-ups. Hope you have a safe and wonderful Christmas Eve!